China Economic Slowdown it's impact on India and Economy. HomeEconomicsChina Economic Slowdown it’s impact on India and Economy. China Economic Slowdown is big concern at international level. Impact of it on Indian economy we will look here. China’s economy grew 6.6 percent in 2018, its slowest speed in almost 30 years. Confirming a slowdown in the world’s 2nd largest economy that could threaten global growth hardly. After some year of breakneck expansion, the world’s 2nd largest economy is losing steam now. No any Western country has matched China’s 10% percent average annual GDP growth rate over a period of last 33 years. The period from 1978 to 2011. East coast cities of China are close to U.S. per capita GDP. TheTrepublic of China will reach 80% urbanization by 2030. The country has aim to further lift 10 million people out of poverty line this year and eradicate poverty by 2020 year. yuan ( or 335 U.S. dollars) are considered as living below the poverty line in China. Which categorised people who are earning less than Rs. 33 a day are poor. The People’s Republic of China is the world’s 2nd largest economy by nominal GDP. It is the world’s largest economy by purchasing power of parity. The country has nearly an estimated $23 trillion worth of natural resources. 90% of which are coal and rare earth metals situated. China also has the world’s largest total banking sector of assets of nearly $39.9 trillion (252 trillion CNY) with $26.54 trillion in total deposits. 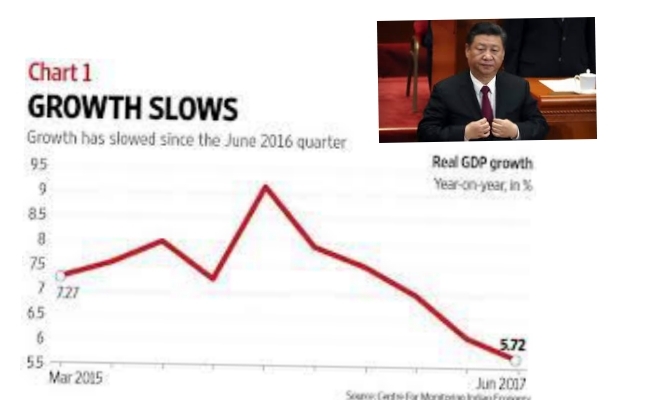 CHINA’S GROWTH IS SLOWING DOWN. sharpest fall in two years of amidst rising trade tensions with the U.S. and fears of a global economic slowdown. from a previous time. This is probably to put added pressure on Chinese exports to the U.S.
Is Saturn Loosing Rings ? There are increasing fears about the Chinese government may further drop its economic growth target to 6% in 2019, from 6.5% in 2018. Given its implications for the global growth and markets across the world have naturally been worried about the fate of the Chinese economy now. China’s stock market, in particular area , is the worst-performing amongst major economies in the year 2018.
earnings due to a slowdown in their sales in Chinas market. Responding to fears of a serious slowdown in China in the economy, the People’s Bank of China (Head Bank) on 16th January, 2019 injected cash worth of $83 billion into the economy through open market operations. It is in order to boost lending of bank and overall economic growth of China. It is believed that the Chinese government may be prepping for a push worth trillions of yuans to step up spending in the Chinese economy. • Decline in Exports from China. • Failure of the Structural adjustment. • Unfavourable Demographic pattern responsible. • Fears of rising debt bubble also causing. requirements and cut interest rates 5ve times since November last year. People’s Bank of China (PBoC) has reduced the share of assets that commercial banks has to hold as reserves. Doing such things gives institutions more leeway for lending, which is particularly beneficial to sector like real estate and industry. Currency Devaluation-: PBoC also devalued Yuan currency multiple times from August 2015 to January 2016 to boost the exports of China. From the start of economic growth of China India’s largest trading partner in goods – started slowing down. concerns have been slightly raised over its possible impact on the Indian economy and market. Total India exports to China in 2017-18 was stood at $13.33 billion which was lower than $14.82 in 2013-14. • Low Commodity Prices- The lower commodity prices could work an advantage as it seeks to revive its own manufacturing sector and try attract foreign companies to ‘make in India’. keeps inflation under its check. more importantly, the manufacturing sector will become more feasible in the wake of reduced possibilities and more opportunities for companies in China. Stocks of India, as a result, are reasonably valued despite their strong run, and could find it easier to attract foreign institutional investor (FII) money in India. The World Bank expects that India to post 7.3% an annual growth this year and 7.5% over the further two years. political event coming in this year in the form of Loksabha elections, that steady growth is expected to continue reported. So, it was complete analysis on China’s Economic Slowdown and it impact.